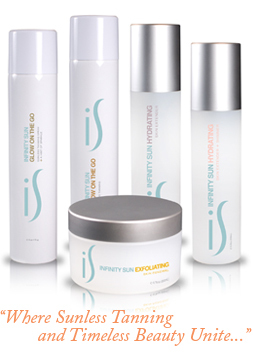 Infinity Sun unites the highest quality skincare products with all-natural, anti-aging sunless tanning blends. Together with enhancement products, our lotions prepare the skin for optimal sunless tanning results. With Infinity Sun’s unique aftercare regimen, your clients will enjoy beautiful, long-lasting results. Timeless Skin Renewing Exfoliant: gentle, skin renewing formula polishes and exfoliates with the natural, non-abrasive pineapple fruit enzyme, Bromelain. By removing non-vital skin cells at the end of their lifecycle, our exfoliant smoothes the surface of the skin, leaving only young and healthy skin cells to prepare the skin for a flawless, long-lasting sunless tan. This is the perfect way to touch up a tan while you're away on vaca! Keep the glow going strong with this timeless tan in a bottle! Infinity Sun Hydrating Extender with Shimmer offers an abundant supply of moisture replacing essentials, natural soothing botanicals, antioxidants, and also adds a touch of sparkle to make your skin glisten. The secret to this amazing formula is the DHA tanning complex combined with mica particulates, which helps to extend the life of the tan while leaving the skin with a shimmering radiance.